I have never been a fan of Mc Donald’s chewy, insipid, burgers and was thus relieved when Burgs opened in Bandra. It was a pleasure eating the real burgers. I love burgers. 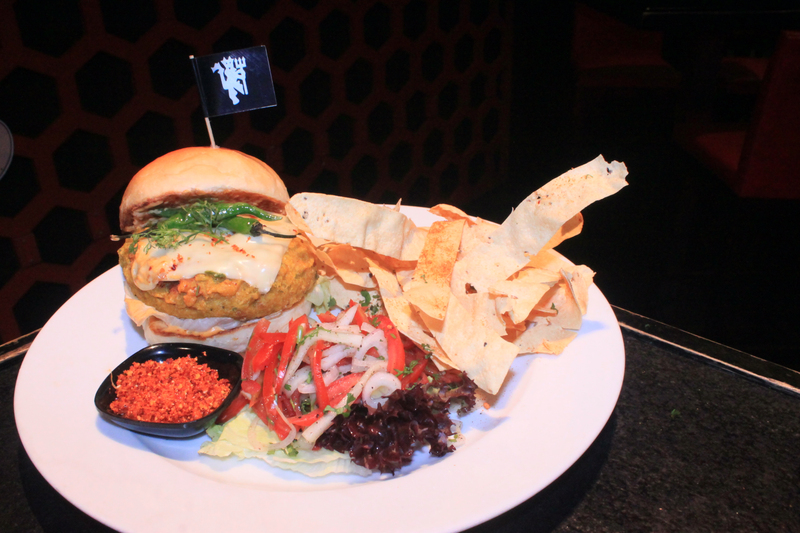 And thus, my joy knew no bounds when Manchester United Café Bar was hosting an International Burger Champions League. I paid a visit to their Malad outlet. The menu was exciting as there was a specialty burger from every part of the world. A treat for football fans, literally. Riveting Rooney from England was an interesting combination of beef slices, with sauerkraut, sautéed mushrooms. As if that was not enough, there were delectable potato wedges and salad to go with it. And the horseradish and mustard mayonnaise was equally exotic. My friend informed me that the burger patty was really juicy and succulent. A real palate pleaser. There was the Donald burger from Lebanon, Yo freddy from America and even a Baichung Burger from India. Cute I thought. All these had a vegetarian version too apart from the Non vegetarian ones. And equally unusual, mind you. But the one that stole my heart was the Barry Burger from Jamaica. A coconut crumbled crabmeat patty topped with plantain chips and cheddar cheese. It was served with Cajun potato and salad and a chipotle mayonnaise. Words fail me, to describe the exquisite flavours. Only the burger patty was a wee bit wobbly and crumbled easily. Understandably so, given the ingredients. Of course, taste wise, it was a first-of-a- kind experience. The Adisak burger from Thailand sounded tantalising too, with a grilled red Thai chicken breast et al, but I could manage no more. The presentation of each burger enhanced its appeal tremendously. The chef had painstakingly created each one. Much appreciated. Prompt and efficient service are the hallmarks of MUCB Malad and it is always a pleasure to dine there. The music, ambience add the right zing, apart from the one that teases your palate. You are in for a great time. I for sure, had a wonderful evening. The festival is thankfully on till February 17, so am going back for a Adisak Burger for sure. Got to taste that one. When are you heading there?